The Donut Ghost House is the first Ghost House on your travels through Dinosaur Land. You must quickly learn one thing: the obvious path will only lead to traps. 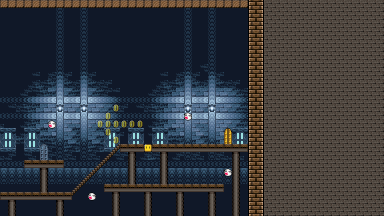 You must outsmart the Ghost House and see through its tricks if you want to complete the level. Yoshi can't enter the Ghost Houses, so you'll be on your own. In this room, ghosts will swoop down from the ceiling to hit you. They're invulnerable so you can't do anything but evade them. Other than that, the room is relatively unspectacular. Run to the end and enter the door you see to get to the next area. Your target is the door up at the top. Unfortunately, the first time you are here, you won't be able to reach this door in any way. Instead, enter the other door in this room to get to the third area. When you return here from the third area, you will be on the bottom ledge. Hit the turn block to reveal a vine. This vine allows you to climb up to the door at the top, which leads to the goal tape. You start on the bottom ledge. The turn block contains a P-Switch, and you can jump through the stairs to get up. It might seem obvious to step on the P-Switch and enter the hidden door the coin arrow points to, but this is just a trap and won't get you anywhere. Instead, enter the door on the right to return to the second area. To find the secret exit, you will need to be Cape Mario. 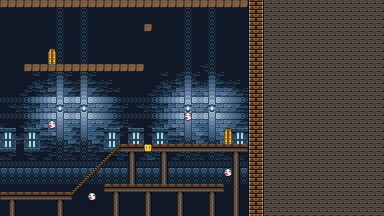 At the very beginning, get some running speed and fly through the ghost ceiling to the top to discover a hidden corridor. Follow it all the the way to the end and drop down to come across four turn blocks, each holding a 1-up mushroom. Enter the door at the end to get to the goal tape, which unlocks the secret exit rather than the normal one. This page was last edited on 24 July 2013, at 21:17.